I am here to share a very important fact with you. Having boxed macaroni & cheese as a side dish with your dinner is OK.
Too often bloggers shun boxed versions. There. I said it! I really don't mean to sound negative, but let's be real for .2 seconds, shall we? Most of us are working or studying all day long. Preparing an entire meal from scratch, while a novel idea, just might not happen every night. If we had the time to do so, I would be making this every.single.day. I try to eat natural and real foods most of time. I really do! But here I am being real with you. Last night Evan and I enjoyed Organic Shells & White Cheddar Macaroni & Cheese (from Trader Joe's) with last night's dinner. 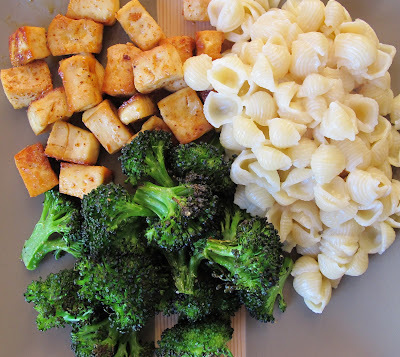 Notice the baked tofu and roasted broccoli? Healthy, healthy! Ingredients: Organic Pasta Shells (Organic Durum Wheat Semolina, Organic Wheat), Organic White Cheddar Cheese (Organic Cultured Pasteurized Milk, Salt, Enzymes), Organic Whey, Salt, Disodium Phosphate. Do you want to see the ingredient list for Kraft Macaroni & Cheese - Premium White Cheddar? Ingredients: ENRICHED MACARONI PRODUCT (WHEAT FLOUR, NIACIN, FERROUS SULFATE [IRON], THIAMIN MONONITRATE [VITAMIN B1], RIBOFLAVIN [VITAMIN B2], FOLIC ACID); CHEESE SAUCE MIX (WHEY, WHEY PROTEIN CONCENTRATE, GRANULAR CHEESE [MILK, CHEESE CULTURE, SALT, ENZYMES], CHEDDAR CHEESE [MILK, CHEESE CULTURE, SALT, ENZYMES], SALT, MODIFIED FOOD STARCH, SODIUM TRIPOLYPHOSPHATE, CREAM, CITRIC ACID, SODIUM PHOSPHATE, CELLULOSE GEL, CELLULOSE GUM, BETA CAROTENE [COLOR]) CONTAINS: WHEAT, MILK. My point is this: for every unhealthy prepackaged product, there's almost always a "healthier" option. Always compare the ingredients and nutritional facts. Of course, I promote whole and natural foods first and foremost, but I think it's important to share other options with you. The mac & cheese from TJ's has less calories, less saturated fat, less sodium and MORE fiber. Pretty darn cool, right?! In conclusion (so formal! ), I want you to know that I do not feel guilty about having boxed mac & cheese last night, even though I'm a food blogger. In fact, I want you to know that I LOVED it! Be honest: are you a fan of macaroni & cheese? !